FILE - White House press secretary Sarah Sanders listens to a reporter's question during the daily briefing at the White House in Washington, May 11, 2018. White House press secretary Sarah Sanders said Saturday that she was booted from a Virginia restaurant because she works for President Donald Trump, becoming the latest administration official to experience a brusque reception in a public setting. The restaurant's co-owner, Stephanie Wilkinson, told The Washington Post that her staff had called her to report Sanders was at the restaurant. She said several restaurant employees were gay and knew Sanders had defended Trump's desire to bar transgender people from the military. No one answered the phone at the restaurant, which was not scheduled to open until the evening. Lexington is about a three-hour drive from the nation's capital and is in Virginia's Shenandoah Valley. Sanders' treatment at the restaurant created a social media commotion, with people on both sides weighing in with their critique, including her father, Mike Huckabee, a former Arkansas governor and Republican presidential candidate. 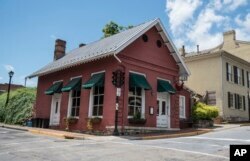 This photo shows the Red Hen Restaurant in downtown Lexington, Va., June 23, 2018. White House press secretary Sarah Sanders said Saturday in a tweet that she was booted from the Virginia restaurant because she works for President Donald Trump. Politically, the town is a spot of blue in a sea of red. It sided with Democratic nominee Hillary Clinton in the 2016 presidential election, 61.8 percent to 31.3 percent. It's the county seat of Rockbridge County, which went with Trump by a similar margin. And it is home to Virginia Military Institute and Washington and Lee University. Brian Tayback, of Shrewsbury, Pa., and Brandon Hintze, of Alexandria, Va., walked by the restaurant during a visit to Lexington on Saturday. Tayback said he believes the owner made the right decision.